Are you wondering what you might do with pumpkin-spiced dinner rolls? Let me offer a few suggestions. These are perfect as a side for your Thanksgiving dinner. Imagine dipping them in turkey gravy or using them to scoop up homemade stuffing. You can also slice them in half to use as buns for pulled pork or serve them with homemade chili. From The Gourmet Kitchen. 1. In the bowl of a stand mixer, whisk the water and yeast until bubbly and allow it to sit for 1 minute. Add the butter, sugar, pumpkin puree, and eggs and whisk until just combined. 2. In a separate bowl, stir the salt and the pumpkin pie spice into the flour with a fork. Attach a dough hook to the mixer, and turn the mixer on low speed. Add the salt and flour to the liquid ingredients. 3. Allow the dough to mix for approximately 5 minutes on low speed. It should be sticky. If it’s not coming together, add up to 4 more tablespoons of flour, 1 to 2 tablespoons at a time. Rub a small amount of vegetable oil on your palms to keep the dough from sticking when handling. 4. 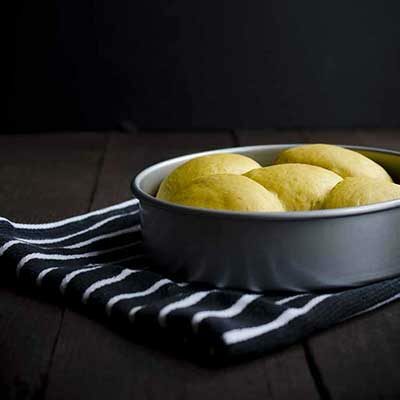 Place the dough in a lightly greased large bowl and cover with a dish towel. Allow to double in size at room temperature, approximately 1 hour. 5. Preheat the oven to 350°F and lightly grease with baking spray or butter two 8-inch cake pans. Divide the dough into 10 equal-sized balls and place 5 in each cake pan. Allow the dough to rise for another 25 to 30 minutes before placing in the oven. 6. Bake for 20 minutes or until an internal thermometer reads 190°F. Serve warm. “These are approachable, produce-heavy, modifiable, impressive, and healthy recipes for the home gourmet.” —Booklist, Starred Review Acclaimed food blogger Jennifer Farley, creator of the Savory Simple food blog and website, showcases a tempting collection of unique and bold-flavored recipes that take home-cooked meals to a gourmet level.In 2009, longtime home cook Jennifer Farley decided to take a leap of faith, change career paths, and attend culinary school. Since then, she has employed her professional training to build a flourishing online food empire, creating original enticing recipes, bringing together vibrant flavors, quality ingredients, and classic culinary techniques. Drawing inspiration from a variety of cultures and cooking styles from around the world, The Gourmet Kitchen offers more than 100 sophisticated recipes and her dazzling, bold photography. From quick and healthy weeknight dinners, to zesty appetizers, to the perfect cinnamon buns for a Sunday brunch, Jennifer provides classic recipes with inventive twists, as well as essential know-how for beginner chefs and the most seasoned cooks alike. 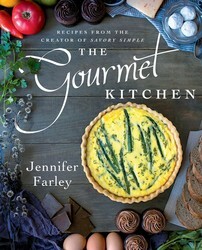 Jennifer Farley is the writer, food photographer and stylist behind Savory Simple, a blog dedicated to gourmet recipes for the home cook. Her work has been featured by Better Homes & Gardens, Parade Magazine, Bon Appetit, and Food & Wine. She lives in Washington DC with her husband, Jeff.